Do you remember playing in nature as a child, or was this something you missed out on? These days, there are many concerns that children aren’t provided with the opportunity to spend time outdoors. 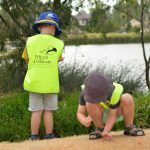 The bush kinder movement aims to change all of that and encourage preschool children to step outside and play in the dirt. 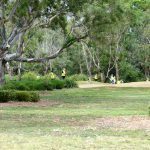 We are lucky that we have Banjo Patterson Park in walking distance of our centre. 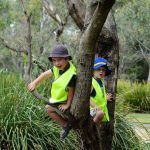 This enables us to provide Bush Kinder to our four year old kinder children on a weekly basis, and to the three year old children on a monthly basis. Kinder opens up opportunities for children to actively learn about how to care for their environment. It teaches them to take considered risks, and investigate new concepts. Discussions with the children are an important part of our preparation for Bush Kinder. They allow the children the chance to ask questions and have conversations about the experience. Before leaving the service, conversations were had with the children about how far we would walk, and what kinds of things we would see and do. Through these discussions the children were able to express their curiosities about their upcoming experience. We arrived at Banjo Patterson Park and the children eagerly began to explore. Trees were climbed, bushes were explored and games began. 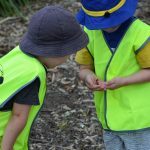 Some of the children initiated dramatic play experiences, pretending to go fishing with sticks, others discovered different creatures living in the area. The children were fascinated by the number of beetles they began to find. The fascination began with a small number of children, but quickly spread to the whole group. Before long all of the children were discussing the beetles and how many they could find. The compassion that the children displayed for the beetles was inspiring to see. 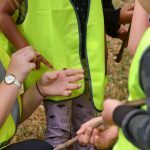 Children were walking around with beetles on their arms and in their hands, being actively cautious not to drop them, or hurt them in any way. The experience also led to some mathematical learning as the children began to count how many beetles they had found. These natural and unplanned experiences lead to some of the most influential learning opportunities for the children. The environment plays such a crucial role in a child’s learning and is often referred to as the third educator. Some experiences and learning opportunities cannot be planned. They need to be experienced and led by the child with the help of the environment. We are so lucky to be able to provide this opportunity for the children and to experience it alongside them. Great blog. Perfect learning activities and good experience of unplanned natural things. Thanks for your comment! The environment certainly plays a significant role in a child’s learning. Thanks for such a fantastic blog. Will plan things for my kid considering this. We’re glad you found it useful.